The course studies the political implications of Artificial Intelligence systems that are applied in different sectors of the economy and society to automate not only simple tasks of perception but, increasingly, also complex ethical decisions. 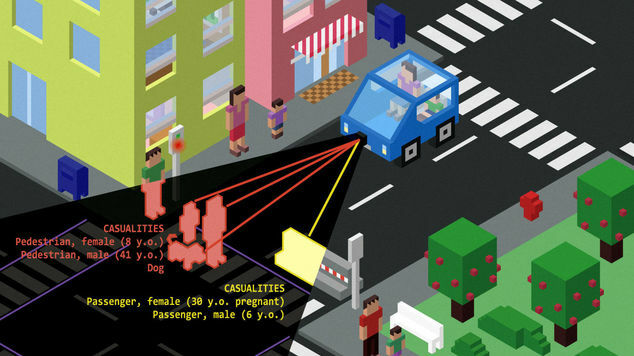 The course will discuss, among others, the controversial online experiment called the Moral Machine that was developed by MIT to propose an ethical framework for self-driving cars (also known as the trolley problem) and the need of a new “Algorithmic Social Contract”. Also reading the traditional literature on ethics and the contributions of science fiction, the course will discuss the impact of AI on the discipline of philosophy itself and the need of a new machine ethics. Requirements for theory certificate (Schein): students can a) make a presentation in class and write a short essay (10 pages), or b) write an extensive essay (20 pages). Colloquia hours will be reserved for discussing and presenting individual projects. All texts will be shared via Dropbox and in German translation where available. Tuesdays 14:00-19:00 / Room: 115. Fortnightly, 14-täglich! First class: 30 April 2019.